Unison Research Unico CD Uno is a full-feature CD player, DAC and Bluetooth receiver, heavily inspired by the flagship Unico CD Due to offer stunning sound for any high-end digital audio aficionado. The DAC portion of the CD Uno is equipped with USB and Toslink inputs, which each route through the built-in ESS Sabre ES9018K2M DAC chip and high-quality IV inverter stage featuring a Texas Instruments NE5532AD. The USB input of the CD Uno uses a latest-generation D/A converter to manage signals up to 384kHz PCM and 11,2896MHz DSD, which effectively covers you for almost every format and sampling rate currently available. The Optical input handles up-to 24-bit/96kHz PCM signals, allowing another high-quality source to be connected with ease. The CD Uno’s Bluetooth functionality allows for wireless streaming from any Bluetooth-enabled smart device. Set-up is simple and the integrated aerial avoids the need for any unsightly appendages attached to the back panel. Similarly, the CD player section uses a premium mechanism and sleek drawer-loading system to neatly integrate into the CD Uno’s imposing facade. Internally, the CD mechanism is shielded by a thick metal cover, to avoid interference. 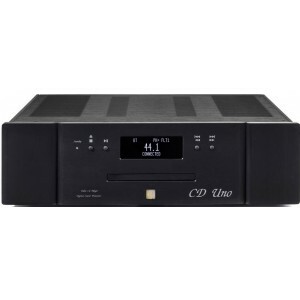 What helps the CD Uno stand apart from its competitors is not just its feature set, but its rich, enveloping sound; which owes much of its expression to the valve output stage. The valve stage benefits from Unison Research’s unrivalled knowledge of tube technology. The audio stage uses one 12AU7/ECC82 double triode, operating in pure class A, followed by a solid state discrete buffer still operating in class A for a low impedance output and ideal audio behaviour. To assist in this sound presentation, the internal circuitry is designed to separate the digital portion from the analogue. The Unico CD Uno makes controlling all its features easy, via the supplied RC2 system remote and its 128x64 OLED screen. The screen offers excellent visibility in all lighting conditions, and can even be switched off during use. Critical information is displayed on the screen in large fonts and active features are displayed in smaller text. So it’s through the screen that you can also tailor the sound performance to suit. With three switchable filters and even the option to bypass the valves with a “solid-state” output buffer – the CD Uno can suit any high-end system or sound preference.